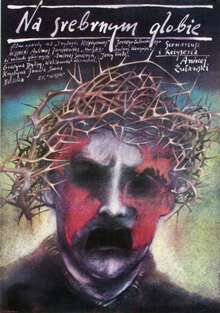 On the Silver Globe (Polish: Na srebrnym globie) is a Polish film premiered in 1988, directed by Andrzej Żuławski and adapted from a novel by Jerzy Żuławski. A group of astronauts leaves Earth to find freedom, and their spaceship crashes on an unnamed Earth-like planet. The astronauts, equipped with video-recorders, reach a seashore, where they build a village. After many years, only one member of the crew, Jerzy, is still alive, watching the growth of a new society, whose religion is based on mythical tales of an expedition from the Earth. The first off-Earth generation calls him the Old Man, treating him as a demi-God. The Old Man leaves them and before his death sends his video diary back to Earth in a rocket. A space researcher named Marek (Andrzej Seweryn) receives the video diary and travels to the planet. When he arrives, he is welcomed by the cast of priests as the Messiah, who can release them from the captivity of the Szerns, indigenous occupants of the planet. Shortly afterwards, Marek organizes an army and enters the city of the Szerns. Meanwhile, the priests start to believe that Marek was an outcast from the Earth, rather than a messiah who came to fulfill the religious prophecy. Jerzy Żuławski wrote the novel on which the film is based, On the Silver Globe, around 1900 as part of The Lunar Trilogy. Żuławski was the granduncle of Andrzej Żuławski. Andrzej Żuławski left his native Poland for France in 1972 to avoid Polish government censorship. After Żuławski's critical success with the 1975 film L'important c'est d'aimer, the Polish authorities in charge of cultural affairs reevaluated their assessment of him. They invited him to return to Poland and produce a project of his own choice. Żuławski, who had always wanted to make a film of his grand uncle's novel, saw the offer as a unique opportunity to achieve this aim. Between 1975 and 1977, Żuławski adapted the novel into a screenplay. He shot the film at various locations, including the Baltic seashore at Lisi Jar near Rozewie, Lower Silesia, the Wieliczka Salt Mine, the Tatra Mountains, the Caucasus mountains in Georgia, the Crimea in USSR, and the Gobi Desert in Mongolia. In the fall of 1977, the project came to a sudden halt when Janusz Wilhelmi was appointed vice-minister of cultural affairs. He interpreted the film's battle between the Selenites and the Szerns as a thinly veiled allegory of the Polish people's struggle with totalitarianism. Wilhelmi shut down the film project, which was eighty percent complete, and ordered all materials destroyed. Żuławski went back to France, saying that he was in despair over the loss and waste of so much artistic effort. [This quote needs a citation] The reels of the unfinished film were ultimately not destroyed, but preserved, along with costumes and props, by the film studio and by members of the cast and crew. Although Wilhelmi died a few months later in a plane crash, the film was only released after the end of communist rule. In May 1988, a version of the film, consisting of the preserved footage plus a commentary to fill in the narrative gaps, premiered at the 1988 Cannes Film Festival. ^ Żuławski, Andrzej. "Na Srebrnym Globie (1987)". Retrieved 2008-04-02. ^ "Festival de Cannes: On the Silver Globe". festival-cannes.com. Retrieved 2009-07-30.